Just when I was becoming accustomed to getting my ragtime music solely from the Internet and recordings, I had a pleasant surprise. Virginia Tichenor emailed to invite me to a New Year’s Eve afternoon concert in Pacific, Missouri. She had taken the time to check a map to see that Pacific is only seventeen miles from Union where I live. It was a perfect time of day since I haven’t ushered in a new year at midnight for over a decade. In addition, because of the proximity, two friends (my neighbor John Phillips who is a professional musician and John Anglin, the esteemed retired theater director where I taught) graciously offered to take me over as it gave them time to get back to their own evening festivities. Though there are a lot of great music venues in the St. Louis area, it is difficult for me to arrange a ride to them and, the truth is, I’m only barely awake after 8:00 pm. Thus, I found myself sitting in the third-floor ballroom of the old Pacific Opera House on New Year’s Eve afternoon listening to the 1908 musical stylings of T. J. Muller’s Gaslight Squares with Virginia and husband Marty Eggers sitting in for the afternoon. Owing to Virginia’s prominence in St. Louis and being the daughter of Trebor Tichenor, one of the early Gaslight Square performers, I had hoped some of the original St. Louis Ragtimers I knew back in the 1960s and 1970s might be there. And, sure enough, sitting just inside the door as I rolled in was Al Stricker, the banjo player in the original group and the spokesperson for the Ragtimers. Al never met a stranger and he remembered the first Sedalia Festival in 1974 very well recalling other participants and relating stories of Bob Darch, I hadn’t heard. He also recalled Trebor’s piece I commissioned and that the group played for the T.S. Eliot Society in St. Louis in 1992. I wrote about it and the ragtime festivals on the Goldenrod Showboat in the January 2017 issue of TST. Larry Melton with St. Louis Ragtimer, banjoist Al Stricker. Though I have been in the Opera House restaurant downstairs many times over the years, I was unaware that the old building was constructed almost entirely from the 1904 St. Louis World’s Fair materials salvaged after the event closed. It is also the oldest opera house in the country that has been under the same family ownership since its opening in 1908. Dan Monahan, a popular St. Louis singer and narrator gave a short, projected photo history of the building during the band’s break. But of course, it was the music we came to hear, and we weren’t disappointed. For the concert, T. J. Muller’s Gaslight Squares featured numbers from around 1908, and the group’s versatility was evident in the variety of their selections and in Muller’s proficiency with trumpet, trombone and banjo. The other members of his regular group included Jacob Alspach (banjo/guitar/ vocals), Jon Weiss (tuba), plus Marty was on piano and Virginia sat in on the drums. She used her old high school drum kit including a great oversized “conga” and a bass with “New Revelations Jazz Band,” her old group, painted on the skin. Marty and Virginia were in St. Louis for the holidays and that made the concert all the more nostalgic for me. Virginia and her brother Andy (principal trumpet for the St. Louis Muny Opera) were only children at the first Sedalia festival in 1974. 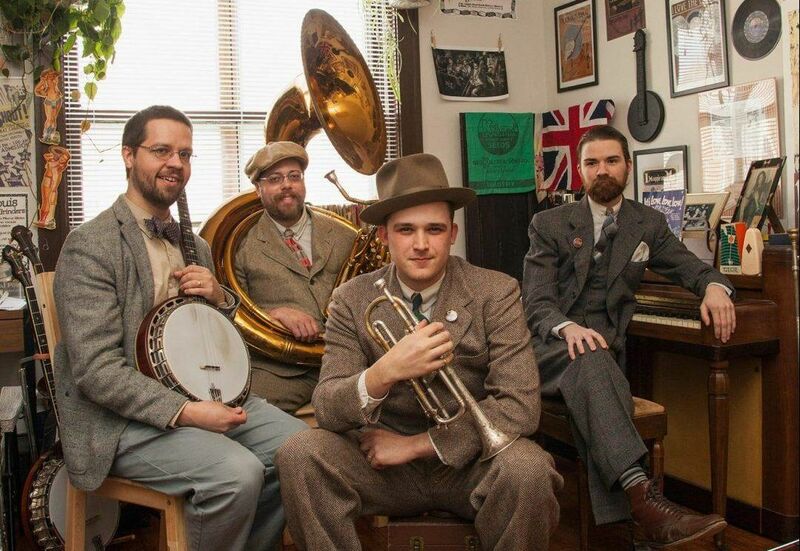 Muller is an Englishman who started his St. Louis group in 2015 after accepting an invitation from Pokey LaFarge to come to the states. Muller has tried to keep the St. Louis Jazz tradition alive and chose the name The Gaslight Squares to harken back to that heritage. I read where Bill Mason, at age 93, occasionally joins the group. Bill was an original member of the STL Ragtimers when they played at the Natchez Queen in Gaslight Square from 1961 to 1965 (then they moved to the Goldenrod Showboat on the St. Louis Levee). Dressed in dapper 1920s attire, Muller reminded me of Ian Whitcomb’s performances at ragtime festivals. All T.J. needs is a ukulele to be Ian’s twin. The Opera House has an original grand piano that Blind Boone played in the early years and Virginia, who is also an accomplished pianist, played Boone’s Southern Rag Medley No. 2 on the vintage instrument. The program also included Marty Eggers playing “Maple Leaf Rag” (my personal favorite) and “Heliotrope Bouquet” (my wife’s favorite piece). Adding to our listening pleasure were three very accomplished swing dancing couples who took to the floor. (We had been informed that the ballroom had once been a roller rink and the skaters made an oval around the two pillars in the center of the large room.) The dancers wore me out with their energy and great moves, and they added so much to the music. What would have been a regular opportunity for most people to hear a great program was a huge event for me. It reminded me how much traditional live music is available these days in the St. Louis area. There are several swing, stride, and trad jazz groups. So, keep this great music playing and support the talented men and women who perform by supporting live music venues. You will get the same enjoyment, over and over, that I had New Year’s Eve afternoon.